I started working on this post a week or so ago. Since the Obama team debuted its Forward theme today, I'll just put it out there. There's plenty of imagery in this old piece of propaganda art. 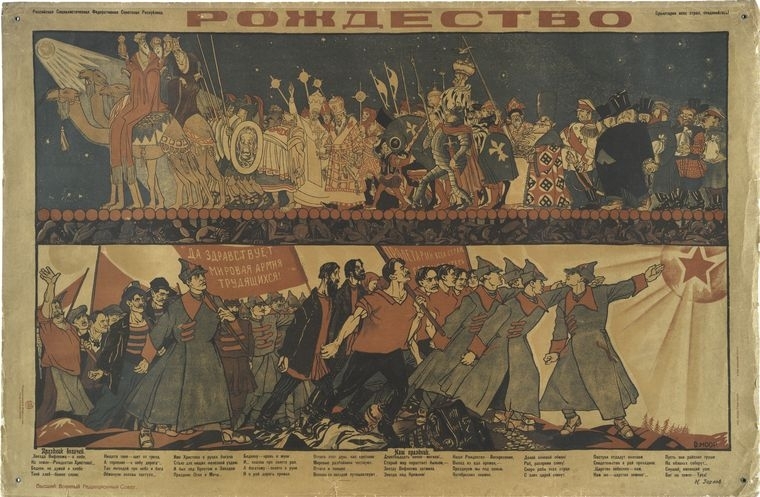 First thing I noticed about this particular piece is that secular revolutionaries of Communism appear to be moving forward toward a risen (or rising) Red Star. Christians are shown moving the opposite direction. The implication appears to be Communism is the future, the Church is in the past. 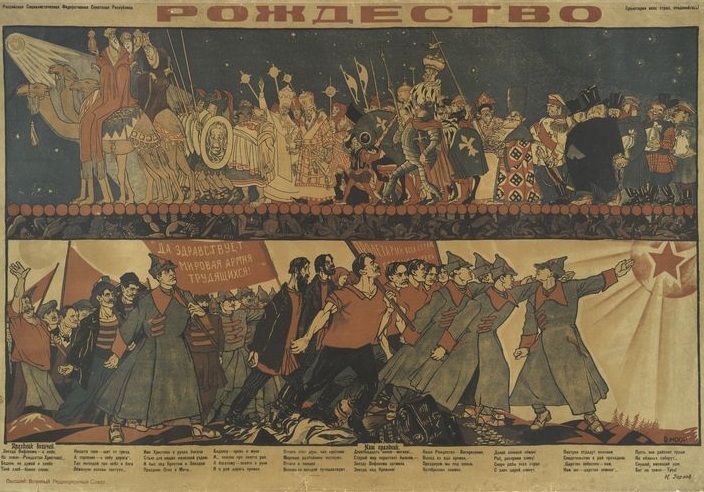 At the same time, this poster (or page from a pamphlet) presents the Russian revolution as an event on par with the birth of Christ, an event to usher in radical change on an epic scale. Strikes me, based on imagery alone, there's a parallel here to how the Obama administration and its progressive allies portray their push against religious opposition to aspects of the Democrats' health care reforms. Think about how many times the mandate has been touted as a necessary move forward, while religious and other conservatives objections have been dismissed as hearkening back to a past or passing era. I've noted from time to time where President Obama or his political campaigns have seemed to borrow from communist, Marxist or socialist themes of the past. Today, is another one of those days. 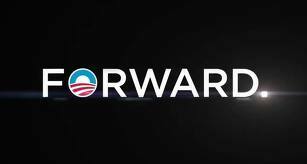 The president's reelection campaign says Forward will be its new campaign slogan. And from Breitbart.com: Comrades! Obama's New Slogan: FORWARD! From Osawatomie to Abe Lincoln to claiming to defend against a war on women, there seems to be a conscious or subconscious force drawing our president and his team to employ tried-and-true socialist slogans and themes. Taken individually, few might notice. Might even be coincidence. But give us string of 'em, and we can't help but wonder what's up. Since initial excitement around a potential bridge blockade, plans have been scaled back significantly. Early Saturday, the labor coalition announced that their May Day plans would include a hard picket to shut down the ferry services, but keep the bridge open. For thirty-one magical days beginning this Tuesday, May 1, we take the plunge and Strike! We block the Golden Gate Bridge; occupy a Manhattan-bound tunnel; seize the ports. In 115 cities, we march into banks, erect tents and refuse to leave. We disrupt financial institutions forcing thousands to preemptively close. Five thousand of us pray, dance, sleep on Wall Street and in front of the Fed and if the Bloombergs of the world bring out paramilitary police to intimidate us, we use our social media fire to call out 50,000 more occupiers and intimidate them right back. I'm not saying they have the means to do it. I'm just passing along what they say they want to do. But in looking at the fine print, Karl Denninger notes government had to run up the federal deficit to make it happen. Just another data point to suggest government continues to do all it can to keep a facade of normalcy alive through the election. In a report published on Tuesday, the Riots Communities and Victims Panel said social networking and TV footage of police officers watching people "loot at will" helped fuel the disorder in London and other UK cities. But the Guardian also reports the panel cautions against shutting down social networks during times of unrest, saying "viral silence may have as many dangers as viral noise." SEATTLE - On Tuesday, May 1, several organizations will be holding public demonstrations in Seattle. This will include an annual May Day March for Immigrant and Workers Rights from Judkins Park to downtown Seattle, an Occupy Seattle-sponsored General Strike, and rallies scheduled throughout the day at Westlake Park. The Seattle Department of Transportation advises that delays should be expected downtown during the Tuesday afternoon commute. We also have evidence that other people may be coming to Seattle on Tuesday with the intention of using the public demonstrations as an opportunity to commit violence, damage property and disrupt peaceful free speech activity. There has been a significant increase in graffiti and posters alluding to violence around the May 1 events. Websites have described trainings in how to conceal weapons beneath signs and banners, and how to target police officers on horses. At a protest at the Port of Seattle in December 2011, several people used peaceful demonstrators as a shield to throw projectiles and incendiary devices at police officers. Early Thursday morning an incendiary device was thrown at a bank in Columbia City. This was similar to an attack on a bank that took place in Portland late Wednesday night. Seattle Police command staff and Mayor's Office staff have been working with protest organizers, property owners, and other stakeholders to facilitate peaceful, constitutional demonstrations. Officers will respond appropriately to criminal acts and threats or harm directed against participants, non-participants, and property. Federal agents in South Texas have opened 123 criminal investigations as a result of a new requirement that border-state gun stores report customers who buy two or more large caliber rifles in the same week, especially those preferred by Mexican drug cartels. The new requirement went into effect last August. Will be interesting to see if the ATF makes cases that stick. Or if the current bunch of investigations is merely to give the appearance that the new reporting requirement is yielding results. While the Chronicle reports cases have been opened, it doesn't cite any prosecutions. At least not yet. I saw a recent collection of Second Amendment political cartoons posted at Self-Reliant Info. And Self-Reliant had an earlier compilation that's linked here. If you're in the mood, here's one more Day by Day from May 2008 (Remember, your local conceal carry restrictions may vary). Hosting last night's White House Correspondents Dinner in Washington, ABC late night host Jimmy Kimmel had plenty of one liners targeting politics, politicians and the media. "Mr. President, remember when the country rallied around you in hopes of a better tomorrow? That was the best one yet." "There's a term for guys like President Obama... probably not two terms... but, there is..."
"Even some of your fellow Democrats think you're a push over, Mr. President. They'd like to see you stick to your guns. And if you don't have any guns, they'd like to see you ask Eric Holder to get some for you." "Last week, we learned the President's two favorite steaks are ribeye and seeing-eye." "It doesn't matter if you're black like President Obama, or white like President Obama or red like President Obama's agenda..."
Yes, there are also digs on Republicans as well. Some hit harder than others. 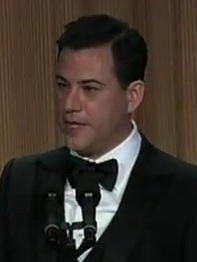 Kimmel's presentation is available on YouTube. Police say a man approached the victims on foot outside Our Lady of Peace Catholic School, pulled out a gun and started firing. Some of the dozen people at the bus stop jumped on to a CTA bus that became a shield. In all, five people were hit by gunshots. How long before the gun control crowd seizes on the Chicago example to push new national gun control measures? The left needs a rally point, especially now that the Mexico narrative it's tried to use for years as been debunked. Some people go to gun shows almost every weekend. Others have never been. If you're looking for one near you this weekend or next, check out this site. Some days, Joe Biden really does shine. I guess what I’m trying to say without boring you too long at breakfast – and you all look dull as hell, I might add. The dullest audience I have ever spoken to. Just sitting there, staring at me. Pretend you like me! Here's an idea. Let's show Joe some appreciation. How 'bout we get Congress to impeach Obama, and let Joe be prez for six months or so? The upcoming NATO summit story gets better by the day. Apparently Chicago's city planners gearing up for summit security had no idea the feds were gonna come in so heavy handed. The image of federal agents on downtown streets far from McCormick Place — in battle gear, weapons slung — three weeks before the summit is certain to have a chilling effect on those who live and work in the Loop. It also calls into question Host Committee Executive Director Lori Healey’s oft-repeated message that Chicago will remain “open for business” during the summit. Are Chicago planners really dumb enough to be caught this off guard? Seems to me, they should have had a clue after seeing the way Big Sis rolled teams into Indianapolis for the Super Bowl. Indy was expecting a friendly football crowd. Chicago knows it has massive mobs of anarchists and other protesters heading its way. "But everyone has a cellphone..."
We have an obligation to help spare our fellow citizens the heartbreak of losing a loved one because someone couldn’t put down their cell phone. Meanwhile, LaHood's apparently not so bothered by distractions like eating behind the wheel or putting on make up. "Not everyone does that," Reuters quotes him as saying. "But everyone has a cell phone and too many of us think it is OK to talk on our phones while we are driving." So, LaHood thinks every driver has a cellphone, but not every driver eats? The Democrat rhetoric of a Republican War on Women almost has a familiar ring. 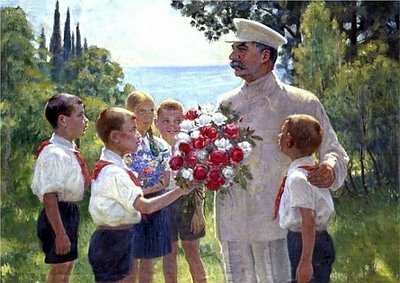 Did the Dems borrow their pitch from an old Commie playbook? 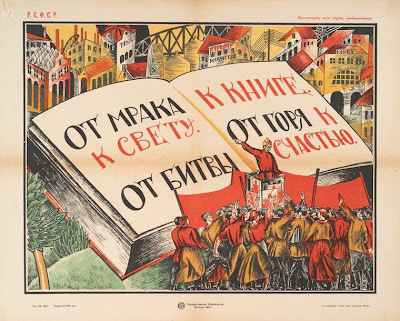 When Communist revolutionaries sought to fundamentally change Russia into a socialist state, they used all kinds of hyperbole to advance their agenda. One of their goals was to reduce the role of the family to heighten loyalty to, and dependence on, the state. For example, Down with kitchen slavery - yes to new way of life! was the theme of a 1931 propaganda poster urging women to break their bonds with home and enter the outside Soviet workforce. Maybe it's not so much that the Democrats seek to stop a war on women as it is they're following through with Barack Obama's promise to fundamentally change America. 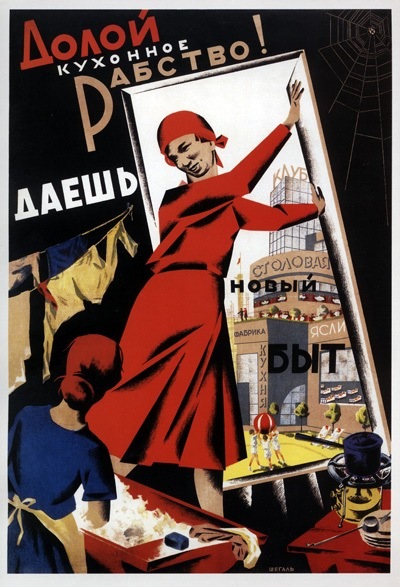 And they've enlisted some Soviet-style hyperbole in an effort to sell that agenda to women. Yup. 4-H and FFA members, and other kids down on the farm can still keep doing what they've been doing. But will his Department of Labor try to revisit the issue later? O's already told the Russians he'll have more flexibility to deal with nukes after the election. Why not farm labor as well? Better safe than sorry, vote the rascal out. Some powerful stuff here. It comes from a group calling itself Free Market America. On this week's show, we looked at what progressives are up to in Chicago, and what may start bubbling up around the country next week. Do you know what historic event some protest organizers are attempting to play off of when they attempt to kick things into high gear May 1st? President Obama's back on the road, trying to scare student loan holders with talk of higher interest rates. It comes in an era when too many people already think economic reality can be suspended by an Act of Congress. And we ponder a data point of two that give hope more Americans may be waking up to the idea things aren't as normal as they seem. 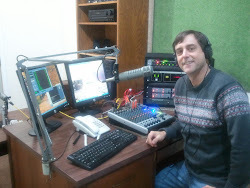 Don and Doug is live on TalkSouthRadio.com each Thursday afternoon at 1pm EDT with the program going into replay upon conclusion. Many past shows, including the most recent, can be accessed on-demand on the Program Schedule (archive) page. The next time some progressive tells you illegal guns in Mexico are coming from American gun shops and gun shows, ask 'em which ones are supplying stuff like this? Grenades, apparently lots of 'em, are working their way to Mexico. Some grenade components have been intercepted coming across the border from the U.S., but now CBS's Sharyl Attkisson reports, in at least two incidents, ATF nabbed the goods, but let the suspect go. If grenades are coming into Mexico from the U.S., they're also coming from Mexico's south as well. The Washington Post reported in 2010 that grenades in Mexico were being looted from Central American military armories. The Post's report comes around the same time as CBS now reports the grenade stash was caught on the U.S.-Mexican border. Many speculate the ATF's Fast and Furious operation was intended to boost the number of guns in Mexico that could be traced back to the U.S., boosting stats to be used to justify expansion of U.S. gun control laws. Did the ATF also have a program in place to blame us for Mexico's glut of grenades as well? Having a parallel grenade history in place might be one way to boost the credibility of the government's U.S. gun flow premise. Grenades have always been a rock solid counter to the government's contention that Mexico's cartels see U.S. gun dealers as a primary weapons supply point. The president already pulled next month's planned G-8 summit from the city. Is there still time to yank the NATO summit as well? Or will Chicago remain on track to become the main launch point for the massive American Spring uprising that the radical left keeps touting? When you take a bulldozer to traditional values, what takes its place is bulldozer ideology, the expedient virtue of bulldozing things and the virtue of whatever rises in their place. Once you believe in the bulldozer, then you must also believe in whatever mess follows in its wake, otherwise you are forced to take a long hard look at the virtue of the bulldozer. And once that happens, you are one step away from becoming a reactionary clinging to traditional values. The passage stands alone. But carries far more meaning when read in context. You can find Greenfield's full essay, All the Morals of a Bulldozer, on his Sultan Knish blog. I see U.S. silver dimes from 1964 and earlier are selling tonight on eBay, in bulk, for around $2.50 each. Minimum wage in 1964 was a $1.25, or twelve and one-half dimes per hour. At tonight's going rate on eBay, that translates to $31.50 an hour. Still think that greenback in your wallet is sound money? It's gotta be a good sign when Huffington Post does a fashion and practicality assessment of concealed carry options for your personal firearm. "Concealed Carry Clothing: Gun Holsters Are Practical, But Still Not Stylish (PHOTOS)"
The video near the end is a great piece about defensive attire that goes well beyond just hiding your handgun. More Democrats are reporting guns in the home, according to a Gallup survey from last October. Now that more Democrats have guns in their homes, maybe more are also catching on to practice self defense concealed carry as well. There's been a lot of talk lately about justice. But a lot of the talk has sounded more akin calls for protests, vigilantism, and what might be called street justice. The Trayvon Martin case is one example. Sometimes the lines can be crossed, messages mixed. It holds true for mass protests as well. Occupy and Occupy-like protests are expected to reignite around the country with a kick off on May 1st. But there too, one person's pursuit of justice may be deemed by others as no more than a senseless act of anarchy or a more sinister attempt to undermine the fabric of our society. Some organizers and supporters of coming protests have tried to peg their efforts carrying forward themes of past anarchist, socialist and organised labor actions. 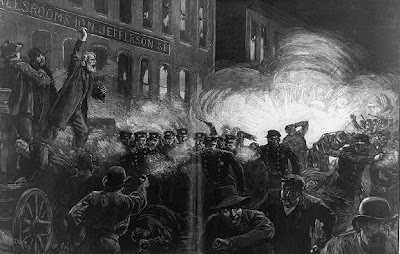 Some specifically cite historic demonstrations and clashes in Chicago in early May 1886 that culminated in what's now known as the Haymarket Riot. 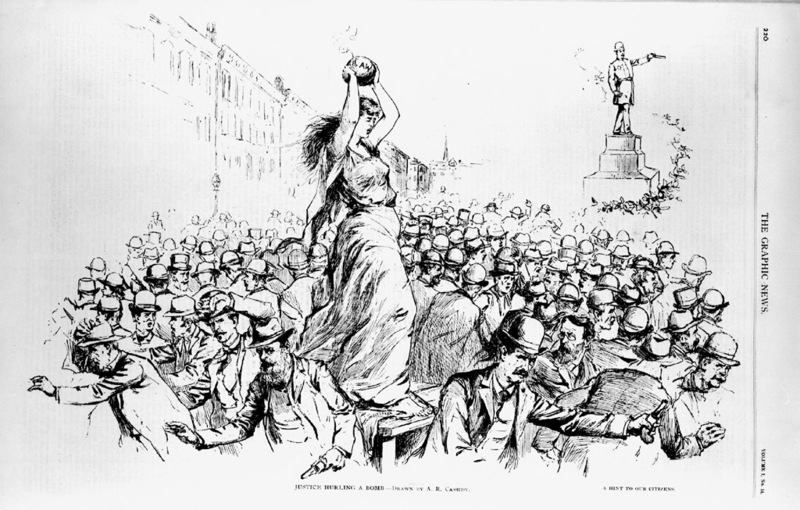 After police clashed with workers as they protested for an eight hour work day, anarchists and laborers responded with a rally on May 4, where someone in the crowd threw a bomb, triggering a retaliatory hail of gunfire by police. Who was in the right, who in the wrong? Depends on perspective. Some of the facts of what actually happened still remain in dispute. At least one newspaper drawing of the era seemed to laud the bombing as an act of justice. The identity of the actual bomber remains a mystery to this day. Those now organizing this May's coming protests almost always include calls for nonviolence. But, despite the best intentions, protest rallies can descend into mobs, and mobs sometimes escalated into rioting. There's also potential for small splinter factions to strike with vandalism and violence while blending in, taking cover within a larger group. As we draw closer to May, let's hope those invoking the Haymarket legacy mean to do so only in a symbolic, metaphorical way. And let's hope there aren't lone-wolves or splinter groups seeking to embrace Haymarket's example in a more literal and violent way. The president stoops to new lows. He urges students to deluge Congress in protest of coming adjustments in student loan interest rates. It was Democrats in Congress that included the adjustment in legislation passed in 2007, but that's not the main point. Loans used to be an agreement between lender and borrower with terms laid out at inception, and expectations that both sides would honor the terms. Student loans have become a government controlled game, now openly manipulated as an election year ploy. Too many have used loans to hide from the reality of our fragile and failing economy. Too many now think, even take for granted, a political fix will free them from the burden of repayment they've placed on themselves. A harsh economic awakening lies ahead. And student loans are just a piece of the individual and government financial unravelings to come. It may be a domestic surveillance drone launched from one of 63 now disclosed sites around the USA! Looks like I've been shut out. Sorry, all events within 50 miles of you are full. There may be space at an event in a larger city a little further away: try a search in a different zip or a broader area. Or, host your own 99% Spring Action Training event. The zip code I put in was for dead-center downtown Atlanta. What larger city might be a little further away? BTW, it looks like the red sock hat guy from Occupy is doing a bunch of the Atlanta training. Is anyone expecting this next round of street action, regardless of what it's called, to be any more focused or effective than last fall's Occupy Atlanta push? 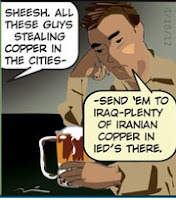 Second City Cop blog continues to serve as uncensored (and yes, un-vetted) eyes and ears as the countdown to the NATO summit advances. Check out the latest post regarding rumors. Meanwhile, it appears some Marxists and socialists and maybe some others are seeking to stir things up in Chicago on another front. Workers World proclaims Chicago has "Racist killer cops on the loose." Is Workers World trying to trigger a second wave of protests in Chicago? Or just trying to give locals motivation to join in the main fray? Workers World opens its story with a lead paragraph invoking the Trayvon Martin case. Is the Chicago narrative they're pitching so lame they had to go there? Well... the article does cite three police involved incidents that Workers World says took place over the past seven years... and one of them didn't result in death. Chicago had 118 homicides in the first quarter this year, and the body count has climbed even higher since then. I've asked it before, and I'll ask it again: Where's the activist rage over that? National Security Agency whistleblower William Binney reveals he believes domestic surveillance has become more expansive under President Obama than President George W. Bush. He estimates the NSA has assembled 20 trillion "transactions" — phone calls, emails and other forms of data — from Americans. This likely includes copies of almost all of the emails sent and received from most people living in the United States. Binney talks about Section 215 of the USA PATRIOT Act and challenges NSA Director Keith Alexander’s assertion that the NSA is not intercepting information about U.S. citizens. Sad thing is, the exaggeration may not be as big as you might expect. Consider our all-too-serious post from March 18: Two Air Force Squadrons activated to support Obama election travel. "I don't think he was calling anyone Hitler or Stalin. He just said, 'This is how these things begin,' " insisted parishioner George Henderson, as he emerged from the Cathedral Sunday after morning Mass. "They're violating the First Amendment when they say you're obliged to follow something you believe is intrinsically evil." "The world’s most powerful governments have printed more paper money in the last three years than in the prior half century!" Still think this will end well? Remember last week when Michelle Obama told supporters in Memphis that Barack brought us out of the dark and into the light? Remember how some folks assumed she was comparing her hubby to Christ? What if the assumption was wrong? What if she chose her words, intentionally or not, invoking comparison to a far more contemporary enlightenment? Mrs. Obama's appearance in Memphis isn't the first time the Obamas have employed symbolism previously embraced by Marxists, Communists and socialists. There was last year's embrace of Osawatomie and, before that, the Obama campaign's embrace of Abraham Lincoln (Yes, many socialists insist Lincoln was a Marxist). The evidence is purely circumstantial, and requires some knowledge of past socialist movements to reach such an interpretative conclusion, but there are times it's almost like the Obamas can't help themselves, and tease us with the path they are taking us down. But, if this is the case, they choose their words carefully so few will recognize the message. Those plans for big spring protests seem to be accompanied by a big power struggle. As we prepare for the May uprising, two power centers of our movement have announced plans for a spectacular bi-coastal May 1st bridge blockade. On the West Coast, Occupy Oakland and Occupy San Francisco are planning rush hour disruptions on the Golden Gate Bridge while in New York City, occupiers say they will block one or more Manhattan-bound bridges. These acts of nonviolent direct action will set the tactical tone for the next phase of Occupy: they signal the turn towards Strike actions aimed at disrupting the flow of money. ...MoveOn wants to hijack our movement with their 99% Spring. MoveOn is an existential threat to our movement because they don’t have a revolutionary bone in their body … if we give these clicktivists any more room then they will pull off a managed cooling of our revolutionary fervor … they will neuter the kind of bold, militant nonviolent direct actions that are the key to the next phase of our movement. Don’t let them do it! And as would be true with any diverse, vibrant movement like Occupy Wall Street, MoveOn members don't agree with everything every Occupy Wall Street supporter says. But we're grateful for the amazing work that Occupy Wall Street has done to highlight deep problems that for too long have been ignored in public discussions. Could get interesting a little later this Spring. How far will each side let the rivalry go when they start taking to the streets? Or are we being played here? Battle for the soul sounds no different than the kind of hypebole we hear all the time from Democrats and Republicans. Is the meaning any deeper when applied to Occupy? If you've got a thing for watching urban civil unrest scenarios evolve, keep an eye on Chicago over the next few weeks. Some residents are already being cautioned to get outta Dodge when next month's NATO summit rolls into town as concern over planned protests seems to be escalating into expectations of riots. Makes it sound like the poor pooch is going hungry. 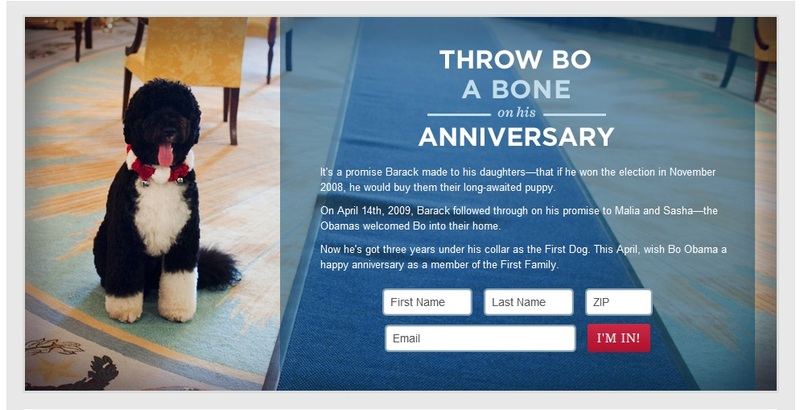 But it's really just a plea to throw the Obama campaign some cash. Not sure when they first pitched this, but it's really kinda funny in light of recent events. You'd think the campaign might want to cool it with doggie themes for a while. Calling all Atlanta area communists, anarchists, and ultra lefties! The group of rebels, workers, occupiers, radicals and comrades organizing around the call for an international day of action this May Day (May 1st, 2012) is putting a call out for revolutionary and anti-capitalist workshops to take place all day at Coen Park on May first. We ask that workshops maintain an anti-authritarian and anti-capitalist messege and remain compatible with the spirit of May Day and in solidarity with those who will be taking to the streets around the globe this May first. We have secured Coen Park in Kirkwood off of Hosea Williams as a safe space to converge and be together. We have already secured the permitts for Coen Park and hope to build this space up to be a hub of activity and a base for those participating in the strike and day of action throughout the day. I may go take some pictures. I suspect there's a bunch of people who think Atlanta communists exist only in the minds of paranoid conservatives. It looks like Egypt's moving to cut Israel's natural gas supply, and Israel seems unprepared for the move. Egypt on Sunday terminated a long-term gas deal with Israel, a stakeholder said, prompting Finance Minister Yuval Steinitz to express "deep concern" over what he described as a move diminishing the peace treaty between the two countries. If the report is accurate, and supplies from Egypt can't be restored, it comes at a very bad time. Last week, the Israel Electric Corporation told the stock exchange it expected demand this summer to peak at more than 99% of its generating capacity, which meant it would have to cut power at peak hours. The plan notes the main reason the country is expected to face power shortages this summer are the lack of natural gas - Egypt largely halted exports following the revolution there a year ago, and Israel's own Tethys Sea reserve is running dry earlier than expected; the delay in executing emergency power generation plans, and the inefficiency of producing power from diesel fuel compared to natural gas. It now looks like that nearly halted Egyptian supply line may have just gone bone dry. There's a battle for religious liberty and integrity being fought on the campus at Vanderbilt University where CNN reports eleven religious have formed a coalition to protest the school's new anti-discrimination policy. They believes the policy threatens the integrity of their organisations. The policy requires student organisations open membership and even leadership roles to anyone, including those who do not share the organisations values or beliefs. After much reflection, discussion, and prayer, we have decided that Vanderbilt Catholic cannot in good conscience affirmthat we comply with this policy. While organizational skills and leadership abilities are important qualifications for leaders of Vanderbilt Catholic, the primary qualification for leadership is Catholic faith and practice. We are a faith-based organization. A Catholic student organization led by someone who neither professes the Catholic faith norstrives to live it out would not be able to serve its members as an authentically Catholic organization. Wecannot sign the affirmation form and remain an RSO (registered student organisation) because to do so would be to lie to the university and to ourselves about who we are as an organization. It appears Vanderbilt has fallen into typical leftist social engineering under the guise of an anti-discrimination policy, but this comes at the expense spiritual beliefs and religious conscience by making them secondary to the constraints imposed by secular policy. Our American society has long had resistance worn down as the politically correct tout values of inclusiveness and celebrating diversity, but don't overlook what's lost in embracing these values. To demand a religious organisation accept members outside its shared spiritual embrace dilutes and displaces the role of religious faith. Those practicing discernment can see it risks destroying the organisations from within. A house divided against itself cannot stand. The bill received prior straight-forward coverage in the Richmond Times-Dispatch. The act by the General Assembly shows strong concerns remain about language in the NDAA that won passage with both Democrat and Republican support in Congress. Some in Congress have flatly denied provisions in the act would allow the military to target U.S. citizens as critics have claimed, but if that's true, why did it Virginia lawmakers see enough danger to compel specific resistant action? Tyrants don't come to power by promising evil. They often ease their way into a path of tyranny only after consolidating power beginning with deceptive campaigns promising goodwill. Even when their consolidation advances to begin silencing religious or other institutions, a state controlled or otherwise compliant or co-opted media often continues with propaganda along the original themes of goodwill. 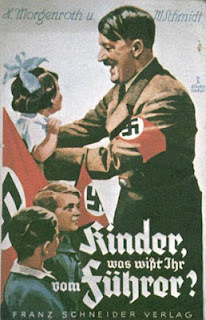 Both Hitler and Stalin embraced images as men who would bring better lives to their countries. Loving images embracing children were common. Few dared speak when their actions took a more sinister direction. Slowly at first, religious and other institutions that might dare speak out were either co-opted or closed. At first, the people couldn't see what was happening or the danger it posed. By the time they did, it was too late. The Catholic bishop in Peoria, Illinois is among those who believe he sees warning signs as the Obama administration escalates a secular agenda and is now doing so by targeting religious communities that live by a different set of values. Last weekend, Bishop Daniel Jenky spoke out, and urged Catholics to use their vote to turn back Obama's power-grab by voting to defend their faith in November. Since speaking out, the bishop's come under attack. Ignoring history's lesson that tyranny starts with small steps, the Anti-Defamation League is among those raising protest over the bishop's call. The ADL now demands an apology for what it deems offensive comments. According to the ADL, the bishop's words diminish the significance of the Jewish holocaust. The ADL misses the bishop's point that secular consolidation and religious persecution that accompanies it, often starts small. Bishop Jenky's example of Hilter and Stalin didn't cite their behavior at its worst, he talked about when they behaved at their best. It is disconcerting others seek to silence the bishop's warning. Intentionally or not, it's as though they seek to prevent us from even considering history's precedent, and wish to see us blindly plod down the road others have traveled unwilling to fathom what may come later. No one has said Mr.Obama is leading us to another holocaust. For now, the warning is limited to his administration's goal of forcing religious institutions to go against their principles of faith to comply with a government's secular mandate. Action to force Catholic institutions to provide contraception coverage is a clear test of wills between the government and the church. Bishop Jenky warns Catholic entities will close their doors if the government mandate is not turned back. It's no longer just a political battle taking place, it's a spiritual one as well. And it's Obama's government that's force the escalation. If government is allowed to trample Catholic conscience now, take time to ponder what it might target next. It's not just Catholic teaching that's at risk of being trampled, it's the concept of constitutional protections clearly articulated in the First Amendment. Whenever Zimmerman’s name is raised, guilty should be raised right along with it. Getting a conviction of Zimmerman is a justified, immediate demand that could potentially help keep this new movement of Justice for Trayvon Martin together. It won’t be easy because his lawyer, along with the courts and police, will do everything possible to get him off. Yeah, the Workers World Party is also upset Zimmerman is allowed legal defense. Count yourself lucky to live in a land where these knuckleheads, and others of a similar bent, aren't in charge. And keep your guard up to keep it that way. President Obama and his administration makes direct attack on the Catholic faith by demanding Catholic institutions provide contracepitve coverage that conflicts with church doctrine. But if the church speaks out against the administration's assault on its faith and values, the left attacks the church for violating the separation of church and state. Barry Lynn, the anti-Christian reverend and director of Americans United for Separation of Church and State, filed a complaint today with the IRS against the Roman Catholic Diocese of Peoria, Illinois. Lynn claims the diocese broke federal rules when the bishop spoke out against Barack Obama’s unconstitutional mandate that forces Catholic institutions to pay for birth control for employees when it goes against church doctrine. The First Amendment was intended to protect religious freedom and forbid establishment of state religion. Today, it's been turned on its head, and is being used to shield the state from counter attack, as government moves to override religious belief and force compliance with its secular power grab. I honestly can't say which is more absurd: The High Times tale of poopy-pants Ted Nugent dodging the draft, or the mind numbed zombies on the left convinced the story's gospel. Based on what I've seen and heard (and I've likely wasted way too much time), it appears Nugent told a preposterous story a long time ago, and a weed lovin' rag published it unchallenged. Try to apply logic and connect some dots. It's not like Nugent was living in the wilderness, or even on a hippie commune. He was a young, rising rocker with an established band called the Amboy Dukes. You'd think Nugent would have had his hands full with song writing, TV appearances, recording three albums between 1967 and 1969, rehearsals and reasonably well-packed concert schedule. One online resource shows the band played the Carawee Ballroom in Flatrock, Michigan three days before the purported date of Nugent's physical, and then played Aquinas High School in Southgate the day after. So we're supposed to buy into a fantasy that he let himself go for a month and spent a week with soiled undies? What chance would a rocker like Nugent have in fooling Selective Service with such a stinky ploy? Seems highly unlikely they're gonna cut slack when a guy in a rock band with a hit record (Journey to the Center of Your Mind reached #16 on the charts in '68) walks into a military physical and tries to pull a real life Alice's Restaurant routine. I can't say 100 percent, but the draft dodger tale looks like nothing more than a bad joke gone too far. But now that it fits the progressive agenda, the left suspends any notion of common sense and keeps right on repeating its Nugent talking point. It's kinda like that War on Women or man-made global warming or Obama's long-gone recovery summer. Flawed data is often spun as settled science and logic frequently ignored by those who still truly believe Obama and programs like Obamacare are the best bets for their future. If anyone has real proof the Nugent story is true, let me know. The folks at Snopes might like to know as well. That said, I'm moving on. Such was the opinion of Thomas Jefferson. 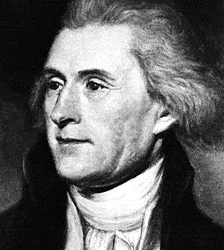 In 1785 Thomas Jefferson wrote to his fifteen-year-old nephew, Peter Carr, regarding what he considered the best form of exercise: "...I advise the gun. While this gives a moderate exercise to the body, it gives boldness, enterprize, and independance to the mind. Games played with the ball and others of that nature, are too violent for the body and stamp no character on the mind. Let your gun therefore be the constant companion of your walks." Can we really afford four more years of 'progressive' leadership? David Codrea has the latest. We might never had heard of Gunwalking or Fast and Furious had Mike and David not dug deep and pushed hard long before anyone else had a clue. I've tried to stay away from the Obama dog eating (pardon the pun) feeding frenzy. And I confess, at times, it has been a struggle. I almost posted that Hitler parody, but decided to just Tweet it instead. Some of those #ObamaDogRecipes on Twitter were tempting too, as were the many of Photoshop pictures, but I just didn't want to go there. Tonight, I cave. Blame Senator John McCain. He's the one who pushed me over the edge. Dog biting man isn't news, but when the president's got a senior senator publicly making dog-eating jokes about him, that makes the cut. 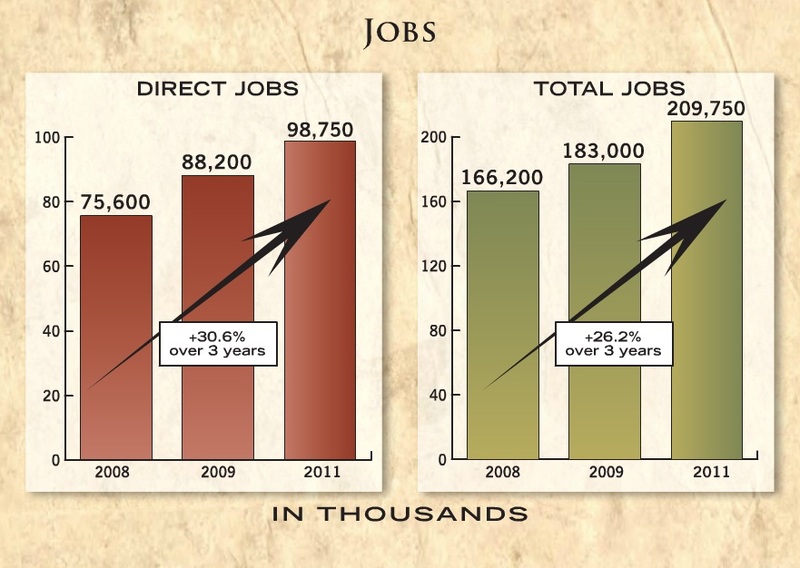 If there's a bright spot in the economy, it's the firearms and ammunition industry. 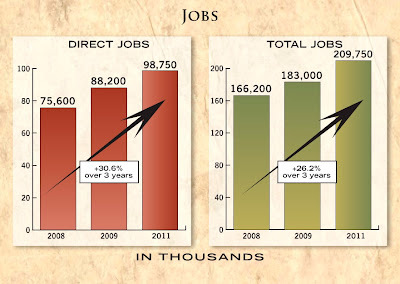 The National Shooting Sports Foundation has released a new report touting the industry's growth and economic impact. The cycle of progressives protesting Ted Nugent's liberty rant may be winding down, but a similar cycle targeting the Catholic bishop in Peoria, Illinois may just be starting. If you heard Don and Doug today, or read my blog earlier this week, you know Bishop Daniel Jenky last weekend urged Catholics to actively defend their faith against attack by secular government. In his homily, Jenky compared the tactics used by the Obama administration to those practiced by Stalin and Hitler. The Anti-Defamation League finds the bishop's remarks offensive, and demands an apology, according the NBC station in Chicago. The ADL apparently feels the bishop's remarks trivialize holocaust deaths. We hadn't seen the ADL story, but Don and I embraced Jenky's message on our show today. Throughout history, rulers with a thirst for power have set to silence the role and influence of the church in attempts to consolidate ever more control under the secular state. That's the point Jenky was making. Neither Stalin or Hitler started big. Theirs was a gradual process, snipping away at religious life and institutions before erupting into full-blown evil on an undeniably massive scale. Our government may still be in the baby (more likely intermediate) steps of a similar grasp, but it quickly moves into what becomes advanced territory by its trampling of religious conviction to enforce mandatory contraception coverage. Strikes me as odd the ADL doesn't see the danger. There is no shame in taking cues from history, noting the signs, and declaring a warning. The time to turn back overreach (tyranny) is at the early stages. Seems to me, it was silence that allowed Stalin and Hitler to advance as they did. But now the ADL seeks to silence a bishop who dared warn of similar trends arising again. Just makes no sense. Ted Nugent came of age at a time when a America had a military draft. Nugent did not serve in the military. With Nugent under fire over his edgy comments last weekend at the NRA, the left has revived the story that Nugent was a draft dodger. Some have even cited an apparent Selective Service document to make their case. In February 1967, Nugent was classified as 1-S (Deferment to complete high school). We can debate Nugent's intent all day. Detractors now rehash tales of Nugent skipping personal hygiene prior to his physical to win deferment. But, even if true (and call me skeptical), soiled undies probably wouldn't rate a status of 1-Y. More likely, his last deferment reflects Nugent's long documented hearing loss associated with his early rock career. Nugent was a long-hair madman rocker when dodging the draft was the stuff of popular myth and legend. But is there anything in his deferment history not in line with tens of thousands of others granted in the era? One final thought. It's nice we have access to documents to help vet Nugent's record. Too bad our president prevents similar scrutiny keeping most records of his past under seal. "Overkill is good for you"
"There's a lot of wimps out there... Rock n rollers just kinda go for it, the wimps just kinda wimp for it." "We go into a facility to play with the general Detroit rock n roll attitude that overkill is good for you." Wanna guess when and where he said these? Take a peek. Same time, same place, Nugent went on to talk firearms, and openly challenged notions behind gun control. That's in this clip. Pretty awesome to see Nugent was rock steady on guns rights back then, and to know he remains unswayed today. Statements here seem to jive with reality. Glad to hear Congressman West's comments now focused on ideology rather than Communist Party labels. Radical as some may be, I still doubt we have any card-carrying big-C Communist Party members serving in the House. To some, there's little distinction between big-C and small-c communists, or socialist progressives for that matter. But failure to parse words to accurately convey small distinctions can be used to discredit what would otherwise been a valid statement. Now, if Mr. West would just back away from his plan for nationalized drivers license standards, I would personally find him far more inline with the small government Tea Party values he promised to bring to Washington DC. An old rocker and a bearded bishop speak out against Obama politics, and say the November election may be our last chance to stand against his progressive agenda. Allen West proclaims he's got those card-carrying Commies in Congress on the run, but is he just jousting with windmills? And Democrats are back to selling Barack Obama as our messiah. Michelle says we lived in darkness until he brought us into the light. Plenty more to talk about Thursday, April 19, on Don and Doug on TalkSouthRadio.com. Show starts at 1 pm EDT. I'm still lovin' the Ted Nugent rant. Coarse as it was, I found the passion refreshing. Maybe we need more rants, not less. Off the cuff political speech can be a good thing when consumed by adults. Let's inject some fervor back into campaigning. Ted's not the only foamer out there (I use the term foamer with great respect ), not the only one to make outlandish statements. And not all outlandishness comes in the form of a rant. If Hilary Rosen wants to attack Ann Romney's womanly credentials based on a resume, go for it. Conservatives are stupid to chase after Democrats hoping they'll rebuke her or shut her up. I disagree with what Rosen said, but her words are a snapshot into the leftist mindset, an unchecked, unguarded data point. Make a note, react if you want, and move on. There are widely different political ideologies at work. But the modern process of political communication is so controlled, so manufactured phony, most people have no concept what the differences really are. Maybe even the politicians have lost sight. I say let the Van Jones, the Ted Nugents, the Hilary Rosens, and anyone else have their say. I have less trouble with them than I do Mitt, who seems a creation built to conceal what's at his core. He just wants to sound nice and be seen as someone who gets along. 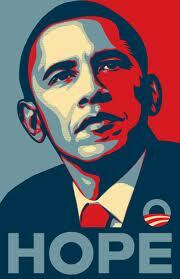 I actually have more respect for Obama's approach (though I am 100 percent opposed to his agenda and reelection). Obama and his surrogates told us exactly what he'd do as president. From destroying coal and shutting down power plants, to a greatly expanded Department of Homeland Security that now acquires drones, arms and ammo on par with the military, it was all on record. But very few people dug past hope and change to ingest the fine print. You gotta know there's plenty of fire and brimstone and objectionable content tossed around behind closed doors in any political campaign. They're running a war room, they're plotting battles. I'd expect talk about lopping off heads (it's a metaphor!) too. It's only been in our dumbed down recent history that a notion was instilled that politics, by the time it gets to the public, must be boiled down to a well-researched, smooth and creamy pasteurized product. I think we'd have a more honest process if we had more unfiltered feeds of the raw story. Most of us encounter at least occassional coarse content in our entertainment, sometimes in conversations with friends and family. Some expections of coarsing in our political-speak might help move our handling of politics back to a more adult level. Sanitized tales of left and right, or business as usual don't cut it. America needs adults, with adult understandings of politics, to tackle the challenges ahead. If it takes ranting to wake us up, so be it. Nugent has a date tomorrow. He's gonna hash some things over with guys in black suits, it looks like. A prudent inquiry by the Secret Service based on actionable information? Or an act of intimidation by government to send a message that free speech isn't a free as it used to be? It would be interesting to know if Nugent's interview is simply a response to standard Secret Service protocol, or was it initiated after higher-ups suggested this course of action. With no apparent sense of urgency in the inquiry, I rate this as political theater, as we wait for the next move. Don and I may share additional thoughts on tomorrow's Don and Doug. We've crossed into the era of Enormous Government. And it keeps getting bigger, more entrenched. 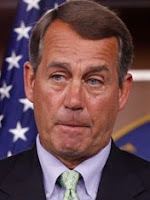 Speaker John Boehner (R-Ohio) on Wednesday accused President Obama of “shrinking from his responsibility to lead” and going “AWOL,” placing full blame for Washington’s dysfunction at the doorstep of the White House. Last thing Boehner should want is Obama trying to lead. Boehner should know it would lead to no good. It's crazy to pretend anything but campaigning matters to politicians at this point. Accept it. It's far better we just wind everything else down as much as possible, and play the next round at the polls in November. "I think it's deadly and dangerous. And I don't use those words lightly." Robin Leach describes Obama's agenda as 'evil' socialism. Yesterday and into last night, I saw so many stories quoting so many Democrats outraged at how violent or how inappropriate Ted Nugent's comments were at the NRA. I awaken now to see the story cycle continues this morning. I wonder how many people actually heard Nugent's comments based on Nugent's own dissemination? What was his NRA audience? A couple hundred? And how many were really paying attention? Thanks to left-wing, progressive activists who posted it online, the video has now had over 145,000 YouTube hits. And its message received play in other media as well. Best I can tell, the original story that got things rolling appeared at Right Wing Watch. And it came along days after the world overlooked what was said. Think about it. With one side of its mouth, the activist left disseminates Nugent's rhetoric to a mass audince. Meanwhile, the left's mouth's other side wants you to buy into spin that Nugent's comments are such a grave threat to the Obama government that they rate a Secret Service response. Suggests to me that the left's not so much worried about Nugent saying what he did. It just wants to create enough stink that others shy away from the kind of fervent campaigning he engaged in. The left prefers a right that campaigns with lackluster predictability where the message is so meek, few bother to notice. Put anohter way, the left wants Republican campaigning to sound like business as usual. Ironically, its tag-Ted strategy may have backfired. A huge crowd has now heard Nugent's call. And he did it so well, with a sales job no politician would dare, more everyday folks now realize just how important November's election really is. It's called energizing the base, and Ted just energized a bunch of folks Romney's own milk-toast rhetoric never will. Can't begin to say how many houses I've seen stripped of copper. Thousand dollar air conditioners smashed and gutted to get at two buck's worth of copper. Nobody likes a copper thief. Michelle Obama equates her hubby with Jesus. And says we lived in darkness until Barack too charge. So reports the Weekly Standard. The left's gunning for Ted Nugent after the aging rocker and gun guy made a hot rant to vote Romney to an audience gathered around him at the NRA convention in Saint Louis. How hot was this rant? A bunch of people on the left quickly rebuked the violence in Nugent's words, and media report the rant has drawn the attention of the Secret Service. What strikes me most about Nugent's comments isn't so much what he says, but how is says it. This is what political speech sounded like in America once upon a time. All or nothing, do or die, liberty or death kind of stuff. I can easily picture an impassioned Patrick Henry invoking similar style were he and his cause a contemporary one. Or envision Samuel Adams delivering a Nuge-like appeal to to a colonial crowd near Boston Harbor. Then again, if Pat or Sam were around today, they'd likely be some Big Sis no-fly and homegrown terror watch lists. They might even have a Homeland Security drone following 'em around. It's silly to hear Nugent accused of an assassination threat, or that the Secret Service is conducting appropriate follow-up. Sounds to me like Ted just spoke off-the-cuff and spoke from the heart. And we have First Amendment protections to cover us when we do things like that. It's time to mobilize against the government's quest for power as it seeks to gain new ground at the expense of religious liberty and practice. Peoria's Bishop Daniel Jenky delivered a strong message along those lines at St. Mary's Cathedral last Sunday. In the late 19th century, Bismark waged his “Kultur Kamp,” a Culture War, against the Roman Catholic Church, closing down every Catholic school and hospital, convent and monastery in Imperial Germany. He's right, you know. Secular campaigns to drive Christians (and Christian values) underground or to monopolize schools, hospitals and other institutions under the control of a secular state, are nothing new. President Obama and his team promote their agenda as if it's something all-new and progressive, but as we wade deeper in, it appears no more than another grasp for control at the expense of personal and religious liberty. In the past, godly people have often awakened to the danger in time, and turned back such threats. Other times, tyranny won its immediate objective, and only after long struggles were religious freedoms and institutions restored. Bishop Jenky seeks to stir Catholics to action before it's too late, and sees coming elections as means to turn back the current assault. I say other people of faith would do well to heed his assessment as well, and to act accordingly. Have grocery pollsters called you? Stand your ground laws. Who do they help more? Are progessives training near you?